The ETMC Cardiovascular Institute is the first in the region to implant a new cardiac resynchronization therapy defibrillator (CRT-D) that’s safe to use in a magnetic resonance imaging (MRI) scanner. “Patients being treated for heart failure with these new devices will no longer be denied MRI scans, which can be a vital tool in detecting and treating other underlying, potentially life-threatening conditions,” said Dr. Raul Torres-Heisecke, with Tyler Cardiovascular Consultants. Designed to help the heart pump more effectively in a coordinated rhythm, CRT-Ds are used to treat heart failure and help reduce the risk of sudden cardiac arrest. 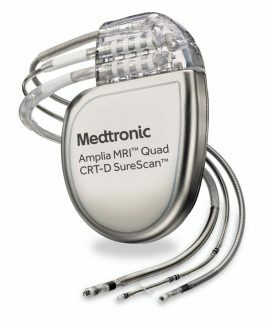 Until now, patients with CRT-Ds have not been able to receive MRI scans because of the potential for a harmful interaction between the MRI and the device. “Over 40 percent of these patients need an MRI within four years of receiving a device. With this new technology, they can receive the tests they need without any problems,” said Dr. Torres-Heisecke. One million people with heart failure are hospitalized each year. Chronic heart failure occurs when the heart is unable to pump enough blood to sustain adequate circulation in the body’s tissues. CRT-D is a cost-effective and beneficial therapy that helps the heart effectively pump blood and oxygen to the body, reducing the risk of death and offering improvements in the quality of life for heart failure patients.